Julia Campanelli, Corey Tazmania and Alice Bahlke in Villainous Company. Photo by Hunter Canning. BOTTOM LINE: A straight-forward crime mystery that allows the audience to focus on three strong actresses at play. Playwright Victor L. Cahn calls his play “a caper for three women,” which is the perfect subtitle for this piece. 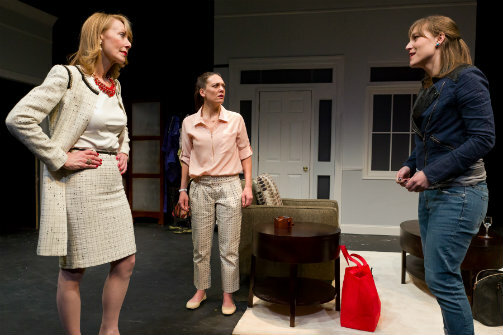 The play is a lighthearted game between three femmes fatales trying to outsmart each other. The result is a little bit of tension and a few laughs as we watch women behaving badly. Claire (Corey Tazmania) returns home from an afternoon of shopping to discover that she has left behind one of her packages. As she dials customer service, Tracy (Alice Bahlke), a woman claiming to be a store employee, arrives with the missing package in tow. With no intention of leaving any time soon, Tracy makes herself at home. As she sips scotch, she reveals that she is not a store employee at all, but a detective who has come to investigate a crime ring in which she believes Claire to be involved. Before long, Claire’s accomplice Joanna (Julia Campanelli) arrives and a three-way battle of the wits ensues. The play is simple, lean and it’s being served a first-rate production by Rachel Reiner Productions. Tazmania, Bahlke, and Campanelli all seem to be having a ball with a script that is unburdened by extraneous backstory and allows them to stay light on their feet. The set design, by Jennifer Varbalow, is elegant, unobtrusive and creates the perfect playground for the game being played. The costume, light and sound designs are appropriate and seem effortless -- the work of solid professionals who had no trouble realizing this production as completely as possible. Still, the play does not produce enough tension or laughs to keep the audience fully entertained. The information in the first act unfolds slowly, and I couldn’t figure out why Claire wouldn’t just throw Tracy out in the first five minutes instead of tolerating her impertinence. I grew weary of Tracy’s unmotivated lingering long before I had a chance to appreciate what was actually happening. Act Two moves along more swiftly with the arrival of Claire’s accomplice, Joanna. The most interesting moment in the play is oddly sexual when Claire insists on searching Tracy for a wire. Tracy emerges triumphant as the highest status player by agreeing to strip. Though the moment is ostensibly practical, the subtext is sexual and quirky enough to keep the audience engaged till intermission. But while sexual tension in the theatre is delightful, I’m not sure that the moment of highest tension in a crime mystery should be derived from a woman taking off her shirt. Villainous Company is perfect for anyone looking for an easy and unimposing evening in the theatre. Having a few drinks before the show will not make you enjoy this play any less. What’s being served here is light and easy to digest, like a mixed green salad even if you’re not that hungry.